Imagine not being able to share a meal with friends or family because you could not swallow most foods. Or what it would be like having to eat through a tube. These are just some of the social, emotional and physical challenges individuals with swallowing disorders, also known as “dysphagia,” face each day. With the help of new technology, and the assistance of a virtual reality program, individuals that suffer from swallowing disorders may once again be able to savor the taste of their favorite homemade apple pie. 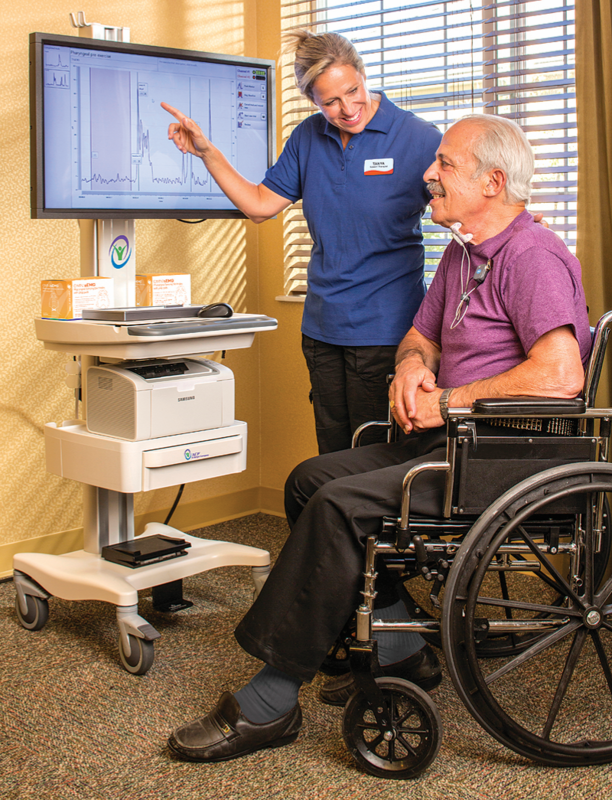 McCrite Plaza Rehabilitation offers this new technology through our Synchrony Dysphagia Solution program. Swallowing disorders can result from a stroke, brain injury, cancer or neurological diseases such as Parkinson’s Disease and multiple sclerosis. This serious condition can often lead to re-hospitalization as well as complications such as dehydration, malnutrition and aspiration pneumonia. Dysphagia is treatable and one way to combat it is through guided biofeedback, which is used in McCrite Plaza’s program. The Synchrony program uses a virtual reality-assisted biofeedback system called OMNIsEMG which allows patients to “see” their swallows on a large monitor. 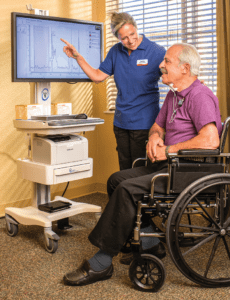 This unique technology enables Speech Language Pathologists and their patients to identify the muscle activity and coordination required for normal swallowing. Treatment outcomes improve as our patients participate in game-like interactive exercises that help them stay motivated and interested in the rehabilitation process. Because our patients find that the activities are entertaining and challenging, they tend to exercise longer, improving their outcomes and speeding up their recovery. The program is eligible for reimbursement by Medicare and most commercial insurers.